USSR: Joseph Stalin is appointed as the General Secretary of the Central Committee of the Soviet Communist Party. CBI - China: Day 93 of 142 of the 1st Battle of Hebei. Spain: Day 261 of 985 of the Spanish Civil War. Spain: Day 626 of 985 of the Spanish Civil War. Lerida, Catalonia, surrenders to Spanish Nationalist forces. CBI - China: Day 271 of 2,987 of the 2nd Sino-Japanese War. Day 56 of 124 of the Battle of Henan. Day 11 of 15 of the Battle of Taierzhuang. Thus far, hundreds of civilians have been killed. Unable to get permission to withdraw, the Chinese Army stays to fight. Day 11 of 39 of the Battle of Xuzhou. USA: Congress grants $300,000,000 for the purchase of 3,200 new military aircraft over the next two years. Germany: Hitler orders his armed forces to prepare CASE WHITE for the invasion and occupation of Poland, to begin by the end of summer. Eastern Front: Day 12 of 13 of the Slovak-Hungarian War, aka the Little War. For the most part, this war is over, but in some places the fighting will continue for another day. CBI - China: Day 636 of 2,987 of the 2nd Sino-Japanese War. Day 18 of 54 of the Battle of Nanchang. 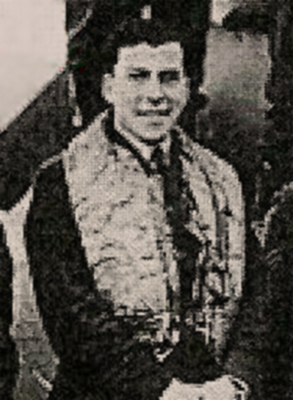 ETO - UK: British Flight Lieutenant Edgar Norman Ryder becomes the first RAF pilot to be shot down on home defense duties when he ditches his Spitfire fighter into the sea off Whytby, England. He was hit by return fire from an attacking German He-111 bomber as he shot it down. Up to this date the Spitfire had downed several Luftwaffe intruders without losses. When the engine of his Spitfire seized up and stopped, it hit the water at 65 mph and rose up vertically with its tail up, rapidly sinking. His parachute caught on the open cockpit hood making his escape very difficult. He was awarded the Distinguished Flying Cross for his victory that day. ETO - UK: Winston Churchill is appointed to chair a committee for war policy in Neville Chamberlain's cabinet. ETO - Norway: German supply ships begin departing for the invasion of Norway. Within hours, the British cabinet is warned of this action. Eastern Front: Katyn Massacre: Over 20,000 Polish POWs, police, military officers and intellectuals are massacred by the Soviet NKVD and buried in mass graves in the greatest and most controversial atrocity of the war. The Katyn massacre (pronounced kuh-TEEN) is primarily of note due to the struggle for several decades afterward over whether Germany or the Soviet Union was to blame. The USSR invaded Poland from the east on 18 Sep 39, 17 days after Germany invaded from the west, taking the area of Katyn and sending thousands of surrendered Polish soldiers to Russia as POWs, along with local police, intellectuals and other undesirables. The slaughter took place during the period of the Molotov-Ribbentrop Pact in which the Soviets allied themselves with Nazi Germany. This pact, named after the foreign ministers of the two governments, essentially divided up Eastern Europe between the two powers. 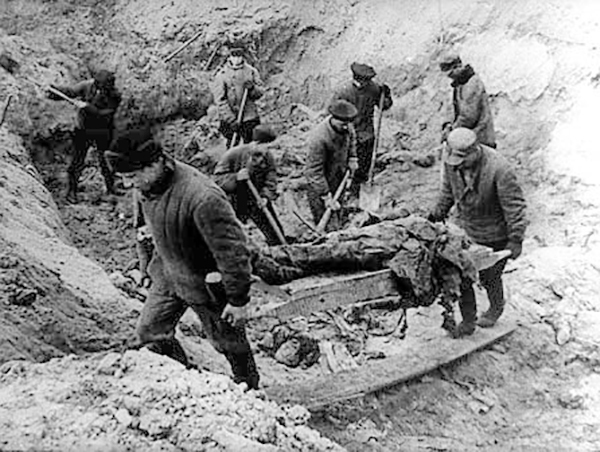 In the section of Poland controlled by the Soviets, over 22,000 Polish officers and civilians were trucked back from Russian camps expressly to be murdered and buried in mass graves. Shortly thereafter, on 22 Jun 41, the Nazis violated the agreement and invaded the Soviet Union. Upon taking the Katyn area of Poland, locals led them to the site of the mass graves. Germany pounced on the opportunity to alert the world to this Soviet crime, which was, of course, steadfastly denied. At this time, the Soviets were fighting on the side of the Allied forces, who had no interest in alienating their military ally. So, both Churchill and Roosevelt tried their best to ignore the matter completely. CBI - China: Day 1,002 of 2,987 of the 2nd Sino-Japanese War. Day 141 of 381 of the Battle of South Guangxi. Day 67 of 67 of the Battle of Wuyuan. Chinese troops have totally secured the Wuyuan region in the Suiyuan Province. Atlantic: The RAF makes an unsuccessful attack on German cruisers SCHARNHORST and GNEISENAU at Brest, France, but some German naval officers are killed when a bomb hits the Continental Hotel. Atlantic: German sub U-76 sinks the Finnish ship DAPHNE 150 miles south of Iceland. Atlantic: British submarine HMS TIGRIS sinks the German tanker THORN 100 miles southwest of Saint-Nazaire, France. ETO - UK: Day 210 of 258 of the Blitz. The Luftwaffe makes a heavy raid on Bristol. Eastern Front: Winston Churchill warns Joseph Stalin (via the Soviet ambassador in London) of the German troop movements into Poland detected by British intelligence. MTO - Greece: German bombers sink the British munitions ship NORTHERN PRINCE 17 miles west of Crete. MTO - Libya: Axis troops advance toward Benghazi. British troops evacuate the city per General Philip Neame's orders. Middle East: Led by Rashid Ali, a pro-Axis coup begins in Iraq. East Africa: Day 298 of 537 of Italy's East African campaign in the lands south of Egypt. In the Red Sea, the Italian fleet sent to attack Port Sudan is attacked by the RAF. Every ship is either sunk or captured. CBI - China: Day 1,367 of 2,987 of the 2nd Sino-Japanese War. Day 21 of 27 of the Battle of Shanggao. CBI - Thailand: Day 185 of 221 of the Franco-Thai War (Vichy France vs Thailand). 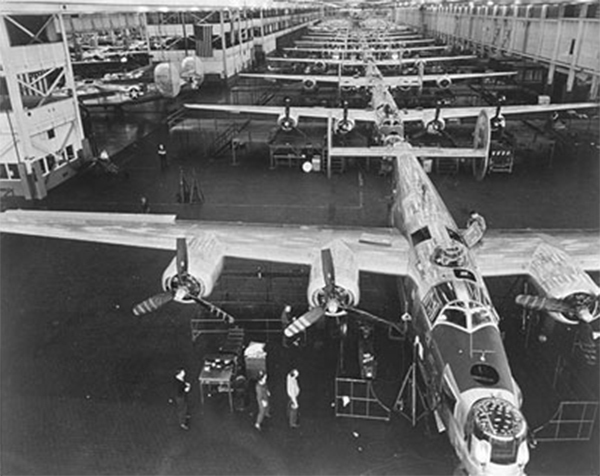 USA: Aviation pioneer Charles Lindbergh begins working on Ford's B-24 Liberator production line at Detroit (Willow Run), Michigan, as a consultant. The 3,000 mile range and 8,000 pound payload of the B-24 heavy bomber, dubbed the "Liberator," represented the Allied Forces supreme effort to regain the initiative over Hitler and his Axis powers. After Pearl Harbor, Charles Lindbergh sought to be recommissioned in the USAAF, but was denied on instructions from FDR. So, he became a civilian technical adviser, first for Ford Motor Company, troubleshooting their B-24 bomber production line, and later as an adviser for United Aircraft, he was sent to the Pacific Theater to study aircraft performance in combat conditions, where he showed Marine Corsair pilots how to take off with twice the bomb load than the fighter-bomber was rated for. Atlantic: Day 80 of 169 of Germany's Second "Happy Time," during which U-boats sink 609 Allied ships with little risk. U-754 sinks the US freighter OTHO east of Hampton Roads, Virginia. Russian Front - North: Day 208 of 872 of the Siege of Leningrad. Russian Front - North: Day 55 of 102 of the Battle of the Demyansk Pocket, another failed attempt to break the siege at Leningrad. Russian Front - North: Day 71 of 103 of the Battle of the Kholm Pocket. Another attempt to break the siege at Leningrad. Russian Front - Center: Day 86 of 103 of the Battle of Vyazma, Russia. Russian Front - Center: Day 86 of 103 of the Battle of Sychevsk, Russia. Russian Front - Center: Day 32 of 49 of the Battle of Rzhev, Russia, a diversion to pull more German troops away from Moscow. Russian Front - South: Day 156 of 248 of the Siege of Sevastopol, Crimean Peninsula. CBI: Day 4 of 11 of the Japanese Naval raids on Allied ships throughout the Indian Ocean. CBI - Burma: Day 111 of 164 of Japan's Invasion of Burma. Japanese aircraft bomb Mandalay in central Burma, killing 2,000. They meet no opposition from the RAF as all their aircraft have by now been withdrawn to India. US 10th Air Force B-17s bomb warehouses and docks at Rangoon. CBI - China: Day 1,732 of 2,987 of the 2nd Sino-Japanese War. PTO - Australia: The first US troops arrive in Australia. PTO - Malaya: Day 44 of 357 of the Battle of Timor Island. PTO - Philippines: Day 117 of 152 of the 1st Battle of the Philippines. 5th Air Force provides air support. ETO - UK: German FW-190 fighters attack at Eastbourne. Russian Front - North: Day 573 of 872 of the Siege of Leningrad. Russian Front - North: Day 334 of 658 of the Siege of the Kholm Pocket. MTO - Tunisia: Day 138 of 178 of the Battle of Tunisia. RAF and US Air Forces provide Allied air support. Day 12 of 16 of the Battle of El Guettar. US 1st Infantry Division captures Hill 369. CBI - Burma: Day 104 of 104 of the 1st Battle of Arakan. The British have withdrawn to reorganize. CBI - Burma: Day 55 of 79 of the Allied Operation LONGCLOTH. US 10th Air Force provides air support. CBI - China: Day 2,097 of 2,987 of the 2nd Sino-Japanese War. CBI - India: The Indian Army Medical Corps is formed by amalgamating the Indian Medical Services, the Indian Medical Department and the Indian Hospital Corps. PTO - Alaska: Day 301 of 435 of the Battle of Kiska, Aleutian Islands. PTO - Caroline Islands: Admiral Yamamoto and his staff depart from Truk for Rabaul, New Britain, on two Kawanishi H8K flying boats to supervise Operation I-GO. PTO - Japan: The submarine USS PICKEREL is depth charged and sunk by Japanese warships north of Honshu. PTO - New Guinea: US 13th Air Force hits a variety of targeted areas. PTO - Solomon Islands: Day 3 of 16 of Japan's Operation I-GO. USA: 24 year old aviator Evelyn Sharp, one of the original Women's Auxiliary Ferrying Squadron (WAFS) pilots, is killed in Pennsylvania in the crash of a twin engine P-38 Lightning. At the time of her death she was a squadron commander, only three flights from her fifth rating, the highest certificate then available to women. One minute after take-off in a twin engine P-38 Lightning and with 700 feet altitude, one of the engines failed. For many pilots, the remaining engine would have torqued the plane over and into the ground. But Evelyn jammed the rudder to counter the effect and turned the plane back toward the field and pancaked the P-38 for a wheels up landing. The plane was not badly damaged, but Evelyn's neck was broken. By the age of twenty, Evelyn was one of only ten women flight instructors in the United States. She taught flying to over 350 men in the Government's pre-WWII Civilian Pilot Training Program in South Dakota and California. When the War Department organized the Women's Auxiliary Ferrying Squadron in 1942, Evelyn qualified as its seventeenth member. She brought more hours to the Ferrying Command than any of the other pilots. 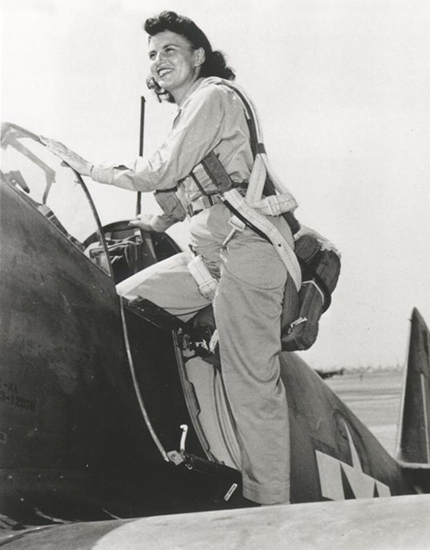 Freeing male pilots for combat, Evelyn flew nearly every airplane in the Army Air Forces inventory. She needed to complete transition to the B-17 before earning the highest rating available. In her short life, she left indelible memories in the hearts and minds of those who knew her and a legacy of aviation excellence that helped open the way for the women pilots of today and tomorrow. 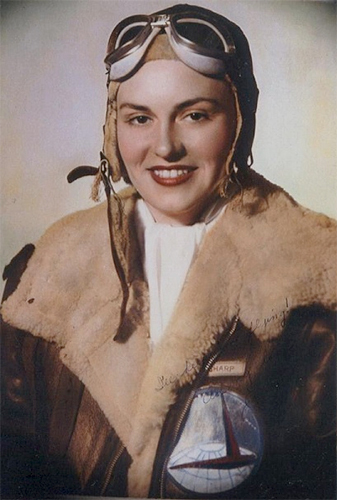 She is buried in Ord, Nebraska, where a public airfield, Evelyn Sharp Field, has been named in her honor. In 1992, Sharp was inducted into the Nebraska Aviation Hall of Fame. Atlantic: Operation TUNGSTEN: British Barracuda torpedo-bombers attack the German battleship TIRPITZ in the Alten Fjord, Norway, scoring over a dozen hits (14 or 15). Atlantic: Aircraft from HMS ACTIVITY and HMS TRACKER sink the German submarine U-288. ETO: US 9th Air Force: Due to a shortage of replacements and abolition of the 50-mission limit tour of duty, a new operational leave policy is set. Maximum leaves for bomber crews are set at 1 week between the 25th and 30th missions and 2 weeks between the 40th and 50th missions. Soviet Union: Condemning the oppression of the Stalin regime, Viktor Kravchenko, a member of the Soviet Lend-Lease Purchasing Commission, announces his defection to the New York Times. Russian Front - North: Day 62 of 191 of the Battle of the Narva Isthmus, Estonia. Both German and Soviet troops in the Baltic region remain in a defensive position. Russian Front - South: Day 102 of 113 of the USSR's Dnieper-Carpathian Offensive in southwestern Ukraine. Russian Front - South: Day 31 of 45 of the Battle of Chernovtsy, Ukraine. Russian Front - South: Day 10 of 15 of the Battle of Kamenets-Podolsky Pocket, Ukraine. Russian Front - South: Day 29 of 44 of the Battle of Snigirevka, Ukraine. Russian Front - South: Day 9 of 20 of the Battle of Odessa, Ukraine. MTO: US 15th Air Force B-24s and B-17s attack targets in Hungary and Yugoslavia. MTO - Italy: Day 78 of 123 of the Battle of Monte Cassino. RAF and US Air Forces provide air support. MTO - Italy: Day 73 of 136 of the Battle of Anzio. RAF and US Air Forces provide air support. CBI: US 14th Air Force: In China, rocket-firing P-40s damage 2 large river boats between Hengyang and Ichang. In French Indochina, P-40s sink 4 small boats and damage 3 more. CBI - Burma: Day 96 of 99 of the 2nd Battle of Arakan. CBI - Burma: Day 30 of 166 of the UK's Operation THURSDAY. CBI - Burma: Day 25 of 147 of the Battle of Myitkyina. US 10th Air Force provides air support. Day 7 of 10 of an action at Nhpum Ga Ridge by the infamous "Merrill's Marauders" against 1,300 Japanese. CBI - Burma: Day 3 of 302 of the Chinese Salween Offensive. CBI - China: Day 2,463 of 2,987 of the 2nd Sino-Japanese War. CBI - India: Day 27 of 118 of the Battle of Imphal-Kohima. PTO - Japan: USS POLLACK sinks the passenger-cargo ship TOSEI MARU in the Nanpo Islands. PTO - New Guinea: Day 35 of 80 of the Battle of the Admiralty Islands. 5th Air Force provides air support. PTO - New Guinea: Day 198 of 219 of the Battle of Shaggy Ridge. 5th Air Force provides air support. PTO - New Guinea: Day 111 of 597 of the Battle of New Britain. US 13th Air Force provides air support. PTO - Solomon Islands: Day 155 of 295 of the Battle of the Bougainville Islands. US 13th Air Force provides air support. ETO - France: Day 248 of 284 of the Battle of Brittany. ETO - France: Day 201 of 236 of the Siege of Dunkirk. ETO - Germany: Day 29 of 46 of the Battle of the Ruhr Pocket. The British 2nd Army reaches Münster while the US 9th Army captures Recklinghausen. Allied troops also capture Hengelo in the Netherlands. US 9th Air Force provides air support. ETO - Germany: Day 3 of 4 of the Battle of Kassel. US 1st Army captures Fulda and Kassel. ETO - Germany: German rocket troops are converted to regular troops and assigned to the German 5th Army Corps. Russian Front - Finland: Day 201 of 223 of the Lapland War. Finland and Russia have joined forces to kick the Germans out of Finland's most northern province. Russian Front - Center: Day 171 of 206 of the Battle of the Courland Pocket in Latvia. Russian Front - Center: Day 69 of 75 of the Battle of Königsberg, East Prussia (now Kaliningrad, Russia). Day 3 of a 6-day Soviet artillery bombardment against Königsberg. Russian Front - Center: Day 53 of 54 of the Battle of East Pomerania, Germany. Russian Front - Center: Day 50 of 83 of the German Siege of Breslau (today Wroclaw, Poland). The Soviets lay siege. Russian Front - South: Day 9 of 21 of the Battle of Nagykanizsa-Körmend, western Hungary. Russian Front - South: Day 22 of 34 of the Battle of Vienna, Austria. The Austrian resistance leader meets with the Soviets to discuss cooperation to prevent the city's destruction. MTO - Austria: US 15th Air Force P-38s bomb the Tainach-Stein railroad bridge. CBI - Burma: Day 59 of 99 of the Battle of Pakokku and Irrawaddy River operations in central Burma. The US 10th Air Force provides air support. CBI - China: Day 2,828 of 2,987 of the 2nd Sino-Japanese War. Day 3 of 91 of the Battle of Zhijiang. US 14th Air Force provides air support. CBI - Borneo: The US coastal minesweeper YMS-71 hits a mine and sinks off Sanga Sanga. PTO - Japan: US 20th Air Force B-29s bomb aircraft factories at Shizuoka, Koizumi, Tachikawa and Kawasaki as well as other targets in the urban areas of Tokyo. PTO - Japan: Day 3 of 83 of the Battle of Okinawa. Special Japanese attack boats sink the American gunboat LCI(G)-82. Japanese special attack aircraft hit and damage the USS WAKE ISLAND. PTO - New Guinea: Day 463 of 597 of the Battle of New Britain. US 10th Air Force provides air support. PTO - New Guinea: Day 347 of 481 of the Battle of Western New Guinea. US 10th Air Force provides air support. PTO - Philippines: Day 166 of 299 of the 2nd Battle of the Philippines, aka the Liberation of the Philippines or the Philippines Campaign. PTO - Philippines: Day 110 of 244 of the Battle of Luzon. 5th Air Force provides air support. PTO - Philippines: Day 25 of 159 of the Battle of Mindanao Island. 5th Air Force provides air support. PTO - Philippines: Day 17 of 135 of the Battle of the Visayas region. 5th Air Force provides air support. Middle East: Israel signs an armistice with Jordan to de-escalate the 1948 Arab-Israeli War, also known as the Israeli Independence War.